Registration is open for the 2018 Western States Forum! 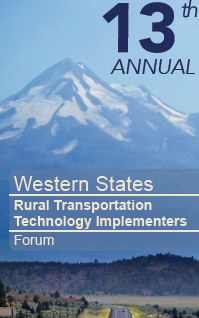 The 13th annual Forum will be held June 19 – 21 in Yreka, California. The Forum is designed for engineering practitioners and provides ITS implementers and engineers with an opportunity to engage in detailed, technical discussions about innovative ITS engineering projects. Each presentation is one to two hours, allowing speakers to present the nuts and bolts of a project, including details such as source code, equations, and component-level discussion. Questions are encouraged during presentations, further facilitating dialogue and depth. Demonstrations and equipment displays will be an integral part of this year’s agenda. In addition, the Forum provides invaluable opportunities to network and exchange ideas and experiences with peers in an informal atmosphere. With the networking opportunities, in-depth and relevant technical program, excellent location, low cost, and quality facilities, this will be an event you won’t want to miss! The Forum is only a few months away and attendance is limited. Please register by May 18th! Visit www.westernstatesforum.org or download a brochure for more information and detailed registration instructions.